Fashion has played a major part in the elevation of footballers to iconic status in modern society. Whether it be George Best's famous clothes shops, Alan Hudson's haircut or David Beckham's unique dress sense, the worlds of fashion and football have often intertwined. This relationship is brilliantly brought to life in "The Fashion of Football". The journey starts with the players and focuses on stars such as George Best, Bobby Moore, Steve Perryman, Alan Hudson, Mike Summerbee, Darren Ward and David Beckham, as well as with a wider range of famous names, like the tailor Dougie Hayward, who designed Bobby Moore's suits. The book then moves on to chart the many influential street fashions that have emanated from the terraces over the years, notably the Skinhead in the late '60s and the birth of the Casual in the mid-'70s. 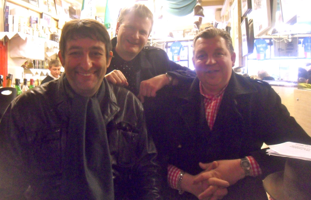 Fans of all persuasions have contributed their testimonies, including the singer Kevin Rowland, the writer Irvine Welsh and members of Cardiff's notorious Soul Crew. This is a unique and riveting read. "This book is a bible for the fashion-conscious football fan"
For fans of both the beautiful game and beautiful threads, this book is an absolute must. This book has been out of print for many years and currently commands prices of at least £20 per copy. The ebook will be released for the remarkable introductory price around £1.99 !! The Fashion of Football is a groundbreaking book that examines for the first time the link between football and fashion. Featuring a selection of rare photographs which enliven the text, the book divides itself into a work of two halves - the first depicting how fashion has influenced the players and the second showing how it has been represented in the stands. We begin in 1962, when restrictions limiting earnings from professional football were lifted and footballers started to splash out on looking good. First we visit George Best's boutique in Manchester, try on the Terry Venables wig and reveal how the 1970s Chelsea team used flamboyant King's Road boutiques to gain the upper hand in psychological battles with fierce rivals Leeds. A brilliant account of a couple of fashion conscious, borderline alcoholics, realising their dream; to research and write a compelling book comprising their two main passions; Football & Fashion. This book is beautifully constructed, ebbing from educational fashion history to talking football down the pub. Hewitt's style is one of great personality, enabling the reader to become involved with every interview made and every trip taken during the book's conception. 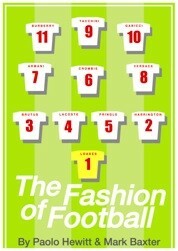 I recommend 'The Fashion of Football' to any lover of either facet; an addictive, entertaining and comical read.